NEW YORK - As world leaders gathered in Paris to commemorate the 100th anniversary of the end of World War One, King Mohamed VI’s enthusiasm appeared less than wholehearted. 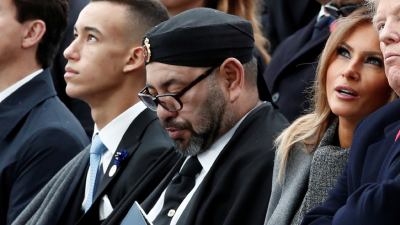 The Moroccan King was in fact caught sound asleep during French President Emmanuel Macron's Armistice Day speech. Though First Lady Melania Trump, seated to his left, seemed totally unperturbed by the “royal slumber,” U.S. President Donald Trump did not attempt to hide his irritation. He shot the sleeping king a nasty look on more than one occasion. The King’s catnap was perhaps triggered by Macron’s statement, “if we think our interests come first and we don't care for others, we are betraying our values.” His comment, “it mustn’t be forgotten that these values and virtues motivated those who sacrificed all to defend democracy . . . these values and virtues gave them strength, they guided their hearts,” was allegedly too much for the King’s ear to bear. The monarch’s attempt to underline the farfetchedness of the event was apparent. Indeed, millions of Sub-Saharan Africans, Asians, and Maghrebis (North Africans) were used as cannon fodder in the Battle of Verdun, and on other European fronts. Although World War One had never concerned the Maghreb (North Africa) and Sub-Saharan Africa, matters were worsened when the Maghreb (an Ottoman territory) changed hands. The Big Four took over the region and its rich resources, and the North African countries became “willy-nilly” sources of military power for France. Germans have been reminded consistently throughout centenary commemorations of the atrocities committed by their nation. It is evident that the former Allies still view Germany as the villain. Nobody seems interested in those who were uprooted from Sub-Saharan Africa, the Indian sub-continent, and the Maghreb, and subsequently died in faraway lands for a cause which was not their own. History may be “written by the victors,” but it was most certainly written with the blood of British and French colonies. French and British historians have dipped their pens in the veins of Maghrebis, Sub-Saharan Africans and Indian soldiers to tell their version of the war. To those colonial rulers, we were not human beings, but infantry - the first to be hit by German machineguns upon leaving the trenches. We were forced to run, to dodge German bullets which “did not pick and choose.” We were not seen as equals in the eyes of the French Army. And just as Irish soldiers and Indian troops were badly treated by their British superiors, we were mockingly hailed as “indigenes” by many French officers. We were reliable and fought with our heads held high. We did not want to crawl in front of any Kaiser's soldier. The brothers soon fell. France, our “homeland” at the time, called up nearly 300,000 North African brothers before enlisting Senegalese, Malians, Chadians and Central Africans. “Die for France and you will have the same rights as the whites” was the slogan of French Third Republic dominant figure Georges Clemenceau (aka The Tiger). But they lied to us. The promises made to the colonies were never kept. And, today, Morocco's king has every right to catch a few 'z' s during WWI commemoration ceremony, no matter how irritated it may make the U.S. President feel. Dr Abdelkader Cheref is an independent scholar in the U.S.